What Colour is Your Purple Heart? 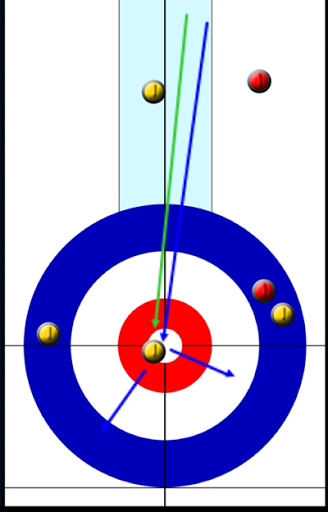 Long before Scott Paper held a tournament for them, curling hearts were purple and awarded to mens teams who fought their way from local club, through tankard playdowns and a victory in their provincial championship, to particpate in the Brier. For a brief period when Labatt took over sponsorship, Purple Heart crests disappeared, only to be quickly re-instated after the curling community made clear to the new sponsor their historical importance. Some of these are extremely hard to get. 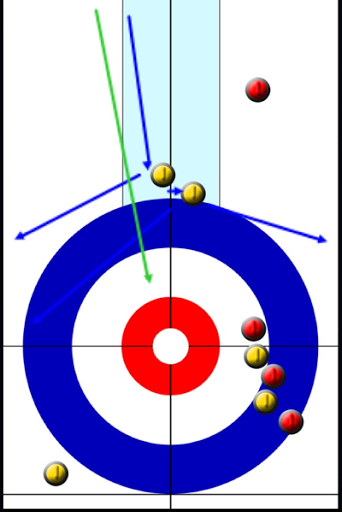 Several Brier champions have only 1 or 2. Other players have a jacket full of them, yet languish at the bottom of the standings every visit. 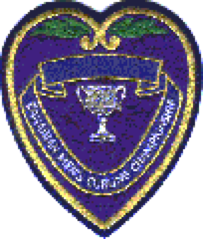 This crest is the dream of every boy that hangs out at the local rink, waiting patiently for a team to shake hands early so they can get 10 extra minutes to practice. 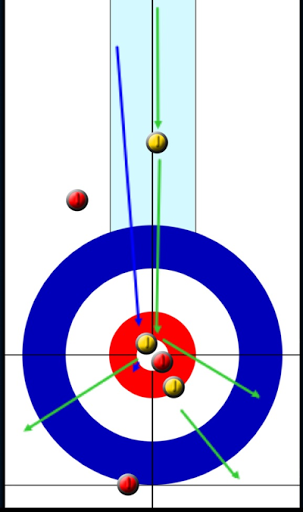 And it means just as much to those who have none (Mike McEwen) to those with 15 (Glenn Howard). 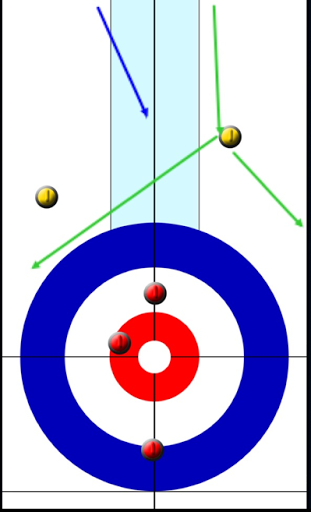 After losing in their zone playdown, Team Howard chose to play in the Challenge Round in a final attempt to qualify for the Ontario Provincial, rather than a sponsors paid trip to the lucrative Skins game. Despite falling short, I'd expect none of them regret their decision. Mike McEwen fell short in his 5th Manitoba final, and after a brave face with SportsNet immediately following the loss, disappeared from view while his three teammates stood in agony, watching the winners ceremony. I don't begrudge Mike for his actions. In most sports, his team could quickly leave the proceedings and share their emotions in private. I understand in Manitoba the ceremonies have stretched to over 45 minutes, requiring the losing team to sit or stand through all of it. I suppose if it's your first wedding as a bridesmaid, you might savor some of the experience. If you find yourself wearing the same seafoam dress rather than white for 4 of the next 5 years, it's likely you won't be smiling in every photo. For a guy that has won more than most the past few seasons, especially where dollar signs are concerned, this little purple crest shaped like a valentine shouldn't matter so much. But it clearly does. Maybe too much, and that's why it's becoming so elusive. Perhaps not all Purple Hearts should be the same. Maybe a Manitoba or Alberta heart should be larger, or a darker shade of purple. The "ahem", easier provinces (and territories) could be more lavender than tyrian. Then again, every kid that grows up in Manitoba knows how scarce the purple heart attached to a Buffalo can be. Every father tells their son of the legend of Gary Ross. Gary had 6 cracks and never finished the job. Mike McEwen is on his way to breaking records that were never meant to be broken. Kerry Burtnyk only managed to get 3 Purple Hearts in his first 19 years. Yes, the game has changed, conditions are better, the pool of talent isn't as deep and the gap between elite and club curler is further apart than ever, but Stoughton's 11 Manitoba titles as a skip is one of the most impressive records in Canadian curling, and may never be surpassed. Mike would be happy to get just one at this point, thanks. Phil Mickelson finally shook off the title of Best Player To Have Never Won A Major (BPTHNWAM) in 2004, and he's managed four more since then. 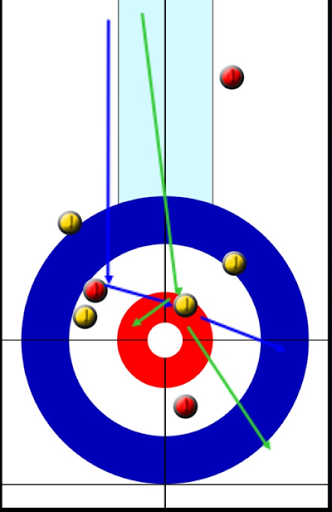 Curlers, like golfers, can have a long career and find success deep into their forties, and beyond (as long as they don't have to sweep). Mike may be the BPTHNWAPH, but as long as his health and his passion remain, I believe the moniker will one day be lifted and passed to another team. Most likely to one in Manitoba, Alberta, or Ontario. No offense to other provinces or territories, but these champions actually have to qualify for their provincials, rather than sign-up. There also is little chance of a 2 team, best of 5 series to determine a winner. I don't mention this as a knock at these other world calibre teams who have an easier entry to the Brier. It's not Gushue's fault he just happens to be in Newfoundland rather than Manitoba. 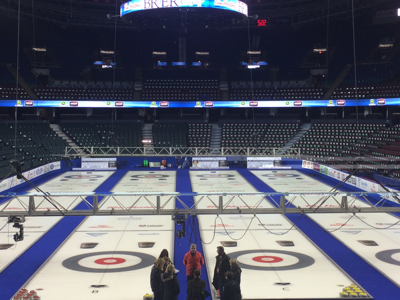 However, teams that are fortunate to escape these deeper provinces usually have greater success once they arrive to the Brier. Might not be a coincidence. I estimate McEwen's odds of NOT winning Manitoba these past 6 years to be just over 3%. Yes, that's a low number, but stranger things have happened, like Kevin Martin's miraculous run to the play-offs in the 2013 Olympic Trials. His odds to beat Howard and Koe in the round robin were less than one quarter of one percent. The crop of young talent in Manitoba is going to be a challenge but if the McEwen rink stays together they still have another 15 plus years to nab at least one of these little hearts. And make a pile of money or perhaps even finagle an Olympic gold medal while trying. So many heartbreaks in the provincials could tear this team apart, but I hope it doesn't. It's rare the sport where you can be #1 in the world and win nearly half the events you enter, but your team unravels because of a loss in a single event. Mr. Hansen might argue McEwen's win in the Canada Cup should mean more. But we all know it doesn't. Not yet anyway. I'll refrain from a deep analysis of the final game, but I should mention one choice to be conservative seemed out of character for McEwen. 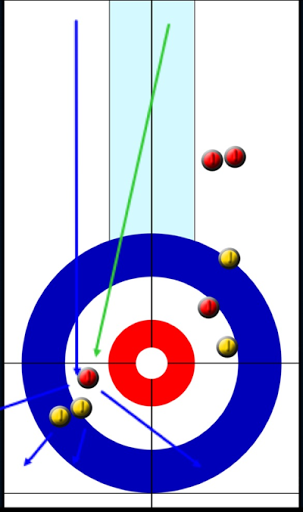 With hammer in the 5th end, rather than come around their own off-centre guard with BJs first, they chose to hit a rock in the 12 foot. I only hope this wasn't an attempt at blanking odd ends. As I've written before, this consideration is over emphasized to a fault. 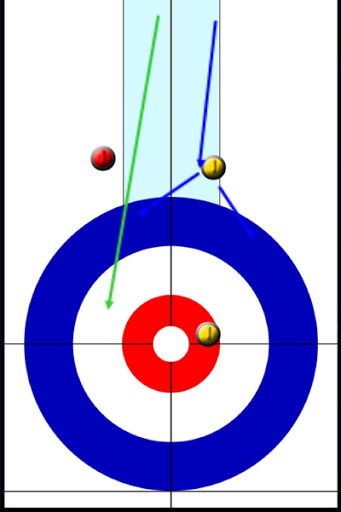 During the 7th end of the semi-final, Ray and Jennifer had a mild disagreement over an intentional blank by McEwen, who was 1 down to Stoughton at the time. Though I enjoyed their playful spat, the correct answer is somewhere in the middle of their arguement. I wrote about this exact situation in my e-book and in a paper submitted to the MIT Sloan Sports Analytics Conference. To summarize, if we assume McEwen and Carruthers to be fairly equal teams, McEwen reduced his win expectancy (WE) around 2-5%. In effect, both Jennifer and Ray were both right, and wrong. At least that's the way I heard it, before hitting the skip button on my remote. 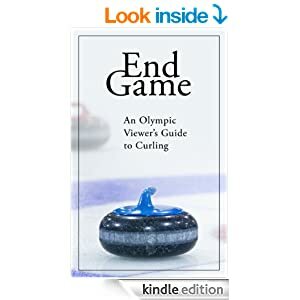 Jordan, Gerry and Kevin are joined by Chris Hodges of CTV in Regina to discuss the recent Canadian juniors, faulty hogline technology and the various Provincial Playdowns taking place across the country this week.